You are probably aware that Nokia World 2011 has now kicked off in London, and during the event Nokia has introduced a new lineup of S40 feature phones. Which they have named the Asha range and includes the Nokia Asha 200, Asha 201, Asha 300 and Asha 303 devices. And we have a demonstration video of the Nokia Asha 200, Asha 300 and Asha 303 for your viewing pleasure below courtesy of the guys over at Phone Arena and by way of The Verge, which lasts just over tow and a half minutes of getting to know about the new S40 phones. So here what info we now know on the Nokia Asha devices, the Nokia Asha 200 is an affordable handset and features a small touch screen with a full physical QWERTY keyboard and features dual SIM card slots, while the Asha 201offers one SIM card slot but otherwise is the same as the Asha 200, and apparently costs just â‚¬60, about $84. The Nokia 300, a candy-bar form factor handset with a resistive touch screen albeit apparently very responsive, along with a numeric keypad below, 3G with HSPA, 5 megapixel camera, and price wise comes in at a reasonable â‚¬85, roughly $118 without contract. 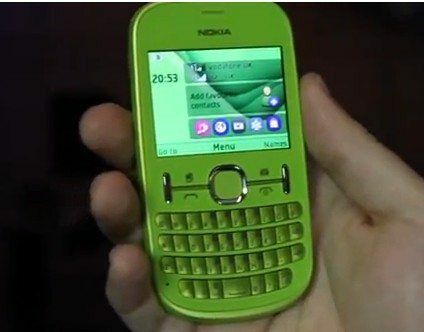 Then there’s the Nokia Asha 303, with a capacitive touch screen, full QWERTY keyboard, curved back with metal battery cover, 3.2 megapixel camera, and is set to release this quarter with a price of â‚¬115 or $160. So with all that said, I’ll leave it right there and let you Nokia fans head on down to hit that play button and check out Nokia’s new Asha S40 handsets…enjoy.